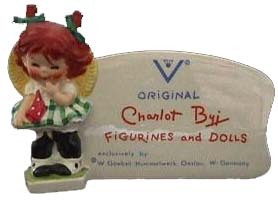 Charlot Byj (pronounced by or bye or buy) joined the Goebel Company in the late 1940’s after Franz Goebel noticed some of her artwork while on a visit to New Your City where she was living at the time. Miss Byj soon began designing the little redheaded figurines that are so collectable today today. Pictured left: Charlot Byj Goebel Plaque. 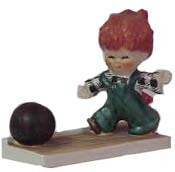 The first figurine was copyrighted in 1957 with the figurine known as “Strike” featuring a little redheaded boy bowling. The series ended production in 1988 with the last collectible figurine being numbered Byj 109 – “A Special Friend”. Pictured left: A Special Friend. 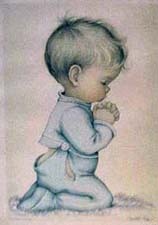 The last number in the series was Byj 110 – “Communion” but this figurine was produced in prototype form only with a total of four pieces being produced. The series includes redheaded children as well as quite a few blonde children. Some were extremely popular and were also produced as brunettes. Black children were included in the series although their numbers are quite small. The redheads were always mischievous while the blondes were more serene or religious in appearance. Pictured right: Little Prayers are Best figurine. A new book featuring Miss Byj’s works is to be available in December or early January 2001. Rocky Rockholt is the author – the book being published and distributed by Schiffer Publishing Ltd.
Pictured left: Print of Bless Us All. The book will include full color photographs of all the figurines as well as Christmas plates and ornaments. The book also deals with the collectibility of the series created by Miss Byj, her wonderful prints, dolls, detailed description of all items, pricing history and a collectors value price guide. Pictured right: Bless Us All figurine. The book will retail for $19.95 or may be purchased from the author for $23.15 each delivered by priority mail to customers in the USA and slightly higher to customers outside the USA. The World Collectors Net Hummel & Goebel information pages. Eye Catching Optical Toys – Magic Lanterns, Kaleidescopes, Stereoscopes and more!